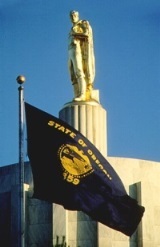 ACEC Oregon develops a legislative agenda each year to ensure that the immediate concerns of consulting engineers and the public’s well-being are represented before government leaders. ACEC Oregon members meet with legislators during our "Day at The Capitol." Issues for discussion include the need for a transportation funding package and implementation of the seismic resilience plan. And we thank legislators for their continued support of Qualifications Based Selection (QBS). (SALEM) – The Oregon Senate gave final approval today to a $5.3 billion statewide transportation improvement plan. House Bill 2017, which passed on a bipartisan 22-7 vote, will raise $5.3 billion for infrastructure over the next 10 years. It will modernize and improve Oregon’s transportation infrastructure by addressing five of the priorities heard most consistently around the state: reducing congestion, increasing alternate transportation options, investing in maintenance and preservation, improving safety of existing infrastructure and ensuring accountability in how taxpayer dollars are spent. It is the result of more than a year of work by a 14-member joint committee, appointed by Senate President Peter Courtney (D-Salem/Gervais/Woodburn) and House Speaker Tina Kotek (D-North Portland). Beginning in May 2016, the Joint Committee on Transportation Preservation and Modernization met with community members and transportation stakeholders across the state, and held numerous public hearings throughout Oregon in 2016 and in the Capitol throughout the 2017 session. The committee incorporated that public input into the final transportation package. Click HERE to view an easy-to-follow graphic explaining the components of the plan. "Legislature needs to fill the transportation funding pothole." Work with other interest groups to pass infrastructure investment packages. Work through the Legislative Committee to identify priority legislation and to create legislative relationships that will help us be successful when the legislature is in session. Help educate legislators and others as to why potential legislation is bad for design professionals and for the public. As we know, very few legislators in Oregon or across the country have an engineering degree or understand and appreciate the nuances of our profession. It is our job to help them understand. When necessary, oppose legislation that would be detrimental to ACEC members. Work to protect current QBS (Qualfications Based Selection) law and expand QBS to more projects in Oregon. 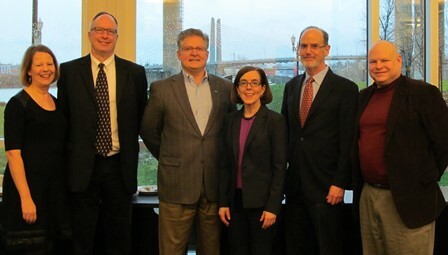 Governor Kate Brown connected with ACEC Oregon members at a breakfast meeting. Future transportation and infrastructure funding and resiliency planning were topics of conversation. The group also discussed the importance of the QBS law. Governor Brown encouraged members to introduce themselves to their legislators and to offer to be a resource for transportation issues. ACEC encourages government procurement policies that support the use of the private sector. Oregon’s engineering companies play an essential role in helping public agencies deliver and upgrade critical infrastructure—to reduce congestion on roads and bridges, provide clean drinking water to consumers, develop energy-efficient and sustainable buildings, and enhance the security and safety of the public. Local and state agencies that contract with engineering firms are able to acquire unique capabilities, adapt quickly to economic conditions and fluctuating workloads, ramp up their programs when funds are available, and ramp down when funding cycles demand savings.